Clinically proven nutrients for healthy cholesterol levels within the normal range. Cholesterol balance is a key indicator of cardiovascular health. Maintaining a healthy cholesterol balance between "bad" low-density lipoprotein (LDL) cholesterol and "good" high-density lipoprotein (HDL) is essential for heart health. Contributing factors to unhealthy cholesterol levels include heredity,diet, age, gender and stress. Truth is, many people may need additional strategies for maintaining healthy cholesterol levels. Take Futurebiotics CholesterolBalance and eat food high in fiber such as fruits, vegetables, whole grains, and legumes and choose low-fat dairy products. Read labels and avoid foods high in saturated fat. Avoid unhealthy fats in cooking; grill or bake. Choose fish, lean meats and other quality sources of protein. Take a complete multi-vitamin and Omega-3 supplement every day. Experts agree that 30 minutes of activity every day can contribute to healthy cholesterol balance. Stress may play a role in raising cholesterol by affecting your choices to overeat or to eat foods high in fat or by smoking. There are several quick ways to help alleviate stress during the day, including visualization and deep breathing techniques. Education-the more you know the better chance you have of reducing the risk of high cholesterol. Diabetics are at greater risk for heart disease and should be extra vigilant in having their cholesterol checked. Know your family's health history and help reduce your risk of high cholesterol and heart disease. Take your supplements and any prescribed medications as directed. Smoking has been shown to raise LDL cholesterol levels and speed up atherosclerosis. Know your cholesterol levels. Work with your healthcare professional, get regular checkups and have your cholesterol checked on a regular basis. Experts advise all adults over 20 years of age should have their cholesterol checked at least once every 5 years and thereafter as recommended. CholesterolBalance - taking inspiration from Nature. This 100 % vegetarian product has an aromatic botanical essence added, along with natural whole plant co-factors from twelve different healthy vegetables. Glass packaging extends natural freshness and helps maintain potency. ViscoFiber - High viscosity beta-glucan concentrate helps maintain healthy cholesterol levels. Plant Sterols - Natural complex including Beta-Sitosterol. 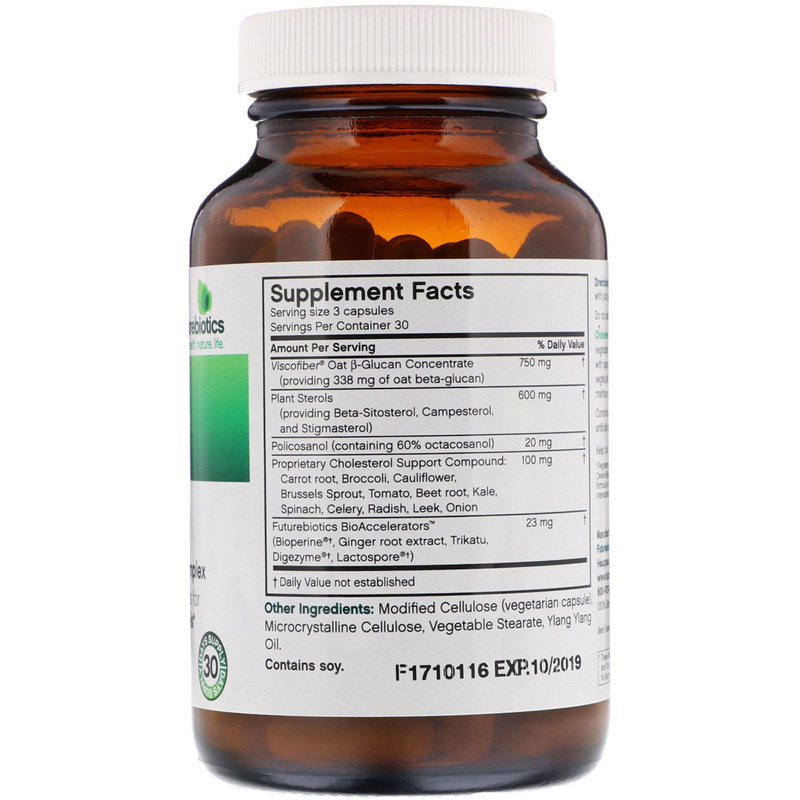 Policosanol - Clinically proven to help maintain healthy blood lipid levels. Clinical research has proven that beta-gluten, plant sterols and policosanol help support health cholesterol levels. CholesterolBalance supports healthy cholesterol levels with scientifically proven ingredients and whole-food natural co-factors from twelve healthy vegetables. Viscofiber is a high viscosity beta-glucan concentrate (non-digestible polysaccharides) derived from oats that has been shown to be 20-30 times more viscous than regular beta glucan extract. Health experts "accept viscosity as a major physiochemical property responsible for physiological effects of consuming soluble fiber", critical in regulating healthy cholesterol levels. CholesterolBalance contains a natural complex of plant sterols, including beta-sitosterol, campesterol, stigmasterol. These phytosterols help lower serum cholesterol levels by decreasing cholesterol absorption in the small intestine. Plant sterols work by reducing absorption of both dietary cholesterol and cholesterol produced by the body. Policosanol has been shown to help maintain healthy cholesterol and blood lipid (triglyceride) levels. The Policosanol in CholesterolBalance is manufactured from sugar cane wax using a molecular distillation process and is the same raw material source used in a variety of clinical investigations. 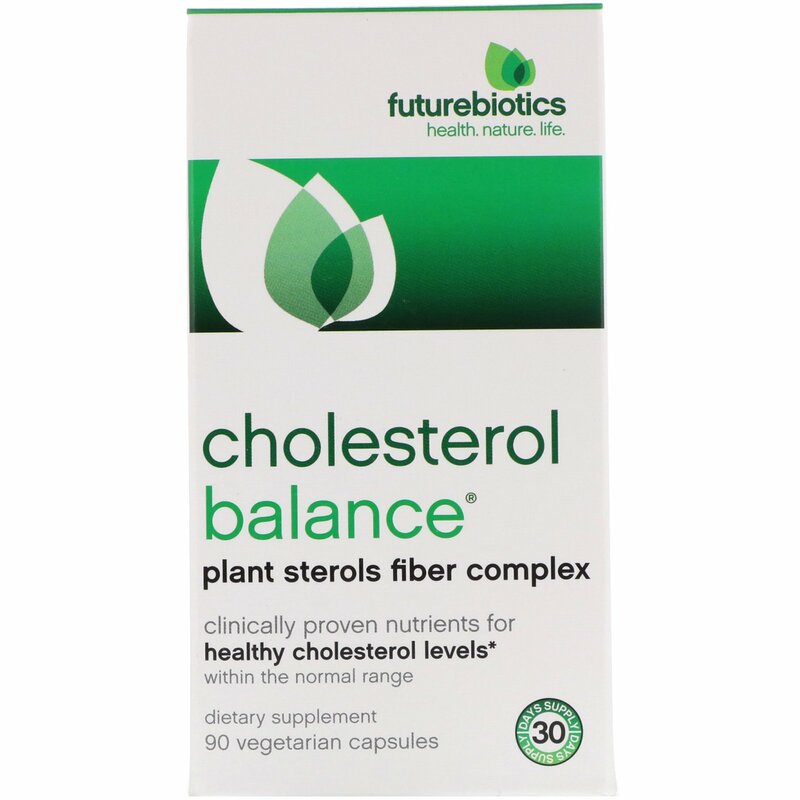 Providing natural-whole food co-factors, a blend of twelve different vegetables have been added for a complete, cholesterol support formula. 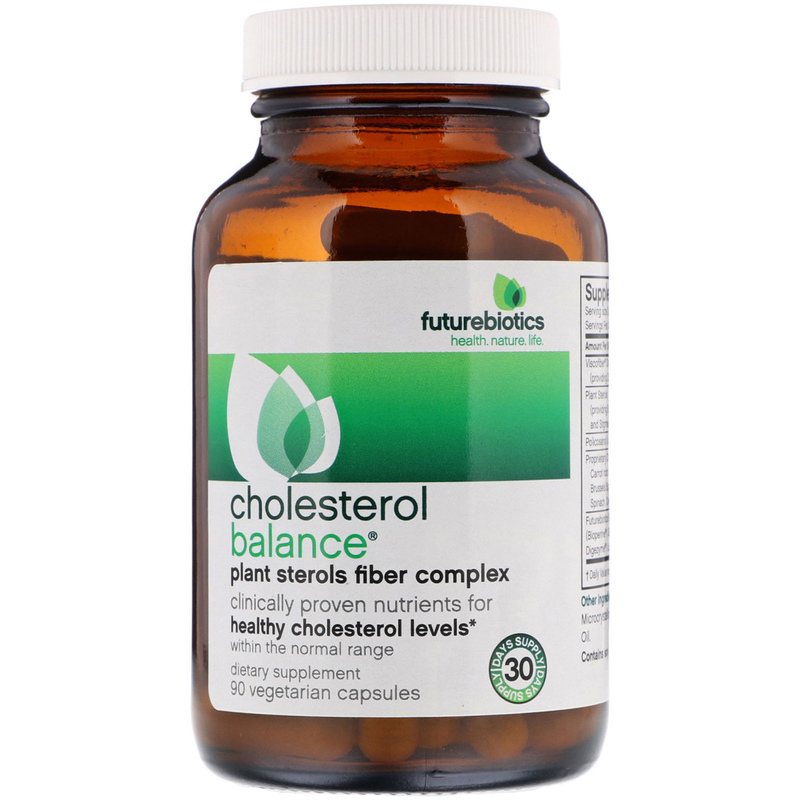 CholesterolBalance is potency-enhanced with Futurebiotics BioAccelerators. Clinically-proven BioPerine (piper nigurm extract) improves nutrient bioavailability, while our proprietary natural compound of Ginger extract, Trikatu, super-potent Digezyme and Lactospore boosts digestion and absorption. As a dietary supplement for adults, take 3 capsules daily with your evening meal. Modified cellulose (vegetarian capsule), microcrystalline cellulose, vegetable stearate, ylang ylang Oil. Contains absolutely no added yeast, sugar, salt, starch, wheat, dairy, artificial colors or preservatives.